Review written by and copyright: Eric Cotenas (7th April 2019). In the northernmost tip of Lapland, there is a legend of a girl unknowingly born a witch, carrying "evil in her belly" to be unleashed at the right moment. She wandered the fells as a white reindeer until she was dispatched by cold iron. Pirita (The Song of the Scarlet Flower's Mirjami Kuosmanen), the spirited and willful daughter of a Lapland elder (The Cross and the Flame's Evald Terho), joyously weds young reindeer herder Aslak (Kalervo Nissilä) in a large village celebration. Newly wedded bliss only lasts so long, however, and Pirita is soon left alone for days at a time as Aslak ventures down to the fells in search of reindeer and his gift of a white fawn is of little comfort. Sensing disenchantment in her husband, or perhaps subconsciously in herself, Pirita visits the shaman Tsalkku-Nilla (Countess for a Night's Arvo Lehesmaa) for a love potion. He instructs her that she must sacrifice the first living thing she sees on the way home to the Stone God and then no herder will be able to resist her. Too late does he realize that Pirita is a witch, and his spell will work in a manner neither one intended. When Pirita sacrifices the fawn, Aslak does indeed seem to her to be more devoted; however, a white reindeer wanders the snows, luring men into the Evil Valley, and then transforms into Pirita's likeness to seduce and murder them. The elders and the women believe the white reindeer is the witch of the legend; the men, of course, see the white reindeer as a prize kill, the easier for them to be lured to their deaths. When one man who survived his encounter with the white reindeer but went mad accuses Pirita of being the witch, his claims are dismissed by others but Pirita herself begins to suspect that she is indeed responsible. She begs the Stone God to take back his magic, not realizing that she is fated to see the legend through to its tragic end. 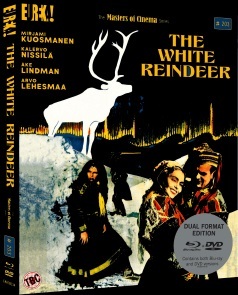 Although hard to see in recent decades until it appeared on English-friendly French DVDs, and more recently with a 4K restoration, The White Reindeer was once one of the most internationally well-known works of Finnish cinema with Cannes Film Festival win in 1953 and a belated Golden Globe win for Best Foreign-Language Film in 1958. Although it had been available for 16mm rental in America, most fans of fantastic cinema probably became acquainted with it through a small selection of striking stills in reference books. What greets the viewer who finally gets to view the film on whatever form of media is a series of striking cinematic contrasts. At once, the film looks technically primitive, with expressionistic black and white lighting and photography reminiscent of a film from at least thirty to forty years before – the look as much as the subject matter brining immediate associations with Witchcraft Through the Ages as much as Carl Theodor Dreyer's Day of Wrath – while the narrative seems to address the stigmatization of female sexuality as evil in more explicit terms than one expects not only of a fifties horror film but also of the austerity the Western viewer comes to expect of Scandinavian cinema by its more accessible examples. Despite Pirita's wild spirit evinced in her introductory scene, she seems neither ostracized by the literally peripheral women nor sexualized by the men – the latter seemingly not until she comes into her powers – but the mechanism that appears to lead to her emergence as a deadly temptress is her fear that her husband's desire for her has ebbed (and it may be quite difficult for viewers unfamiliar with the seasonal routines of reindeer herding to assess just how much time has passed between the wedding and a scene in which her face registers visible hurt when Aslak sleepily turns onto his side away from her in bed). The bliss between the two in the aftermath of the spell seems quite chaste in contrast to the scenes of her stalking and killing other men, and it may indeed be that the spell does not bring her direct sexual pleasure with her husband so much as an subconscious feeling of contentment she associates with her husband's closeness. A church wedding sequence in which her unwavering trancelike stare distracts the groom (Nina and Erik's Aarne Tarkas), who is soon to sight the white reindeer and pursue it against the pleas of his bride (Inke Tarkas), may either be the witch's desire to destroy a happy couple or Pirita's own unconscious resentment of the bliss she has lost seen in other people. As radiantly beautiful as she is presented to the camera from her first close-up, the only time that she is seen looking into a mirror that she sees staring back at her a fanged face of evil as if she is being punished for entertaining any thoughts of vanity; and yet, she seems to exist apart from the sexually oppressive atmosphere around her even before she turns into the "white witch reindeer," venturing out as she does after her husband into the fells or on her own into the snowy valley to consult the shaman or make an offering to the Stone God in his graveyard of jutting antlers – one set used in a striking composition framing her the distant figures of Pirita and the fawn upon their arrival – acts which are taboo but not completely forbidden but bring about evil in her case. The climax does indeed possess a mythic quality that likely resonated with international viewers however exotic the more documentary aspects of the Laplanders (who themselves might have even seemed entirely fantastic by the uninformed). While its effects are simplistic, one does indeed wonder how many horror filmmakers from America, Britain, Italy, and Spain might have been among the film festival audiences to which The White Reindeer played and been inspired by it, perhaps more so than Ingmar Bergman's The Virgin Spring. Although well-received theatrically, The White Reindeer was relegated to the 16mm rental outlet in English-speaking countries until an English-friendly DVD came out from French label Artus Films. While Finnkino's original DVD had no subtitles, their recent Blu-ray included both English and Swedish subtitles. Eureka's 1080p24 MPEG-4 AVC 1.37:1 pillarboxed fullscreen Blu-ray is derived from the same 4K restoration which has not completely done away with film-specific damage throughout, retaining bits where it was likely impossible to seek undamaged portions from other surrounding frames like a number of transitional shots and reel changes. The monochrome image evinces a multitude of grays where once the white reindeer vanished into the snow in the distance shots while the reindeer herd was once a mushy mass of black and dots of white are now undulating waves of fur and antlers sometimes almost individually distinct more or less depending upon the crispness of focus. The Finnish mono audio is cleanly rendered in LPCM 2.0 with some light surface hiss evident in moments of extended silence. English subtitles are optional and free of errors. While some of the extras are ported over with new translation from the Finnish Blu-ray, Eureka has included some new extras of their own starting with an audio commentary by film historian Kat Ellinger who discusses the relationship between cinematographer-turned-director Erik Blomberg (Wedding Night) and actress Kuosmanen was more than husband and wife, with the spoiled daughter of a wealthy industrialist's reputation as a "spirited wild cat" informing the character she plays in the film which was co-written by the couple who met on an early production in which Blomberg was cinematographer. Ellinger also links the film to the folk horror movement – likening the film to Frantisek Vlácil's Marketa Lazarová – and the current practice of using the label as an umbrella term while also seeking to provide a more concrete definition of the elements that make up the genre. Ellinger also suggests that the film found an audience with the west through its incorporation of recognizable gothic elements – along with the same year's more conventional Return of the Witch, also from Finland – that would inform the horror industries of other countries later in the decade and into the sixties. Although she suggests that the white reindeer legend was made up by Blomberg and Kuosmanen to dress up the ethnography of the Sami people with something familiar to wider audiences, she does not avoid discussion of the effects of Christianization on their traditional way of life in the nineteenth century and enforced sterilization measures carried out against them in the early twentieth century. Also exclusive to the Eureka release is "Religion, Pleasure, and Punishment: The Portrayal of Witches in Nordic Cinema" (22:23), audio essay by film journalist Amy Simmons who traces the origins of the sexualized depiction of female witches in Nordic cinema in the salacious witch-hunting manual Malleus Maleficarum, and a survey of Nordic witch films starting with the silent Curse of the Witch – the actual first Finnish horror film rather than White Reindeer which was for a long time thought to be the only Finnish horror film – and Witchcraft Through the Ages, Dreyer's Day of Wrath to Lars von Trier's take on Medea before coming full circle with the hellish extremes of Antichrist. Not provided for review are the reversible sleeve or the limited edition O-card slipcase is included with the first 2,000 copies, but Eureka did provide a facsimile of the collector's booklet featuring new writing by film critic and writer Alexandra Heller-Nicholas and journalist Philip Kemp. In "The Passion of the Snow Witch," Heller-Nicholas avers that the film is indeed based upon some real Lapland legend but also notes the very real history in the area of the persecution and execution of witches in the middle ages, and also discusses the virgin/whore binary as explored here through "the poetic metaphor of Sami culture" (noting the ethnographic aspect to Blomberg's camera) while in "Vampire of the Snows," Kemp also offers an analysis of the theme of female sexuality in the film while also discussing the relatively late entry of Finland into the film industry and Blomberg's place in its development. The remainder of the extras are carried over from the Finnish Blu-ray starting with "With the Reindeer" (7:48), a 1947 documentary by Blomberg and Eino Mäkinen that might be best watched before the feature to get not only an understanding of Lapland reindeer herding but also a picture of the setting that inspired Blomberg and Kuosmanen. Also included is Colour Test Footage (1:09) of Kuosmanen, and one is not sure whether it is the home movie quality of the footage or the bright saturated colors in general that would have sapped the mood had the feature been shot in color. The extract from "Jussi Awards Ceremony 1952" (1:11) focuses on the ceremony's other major awards, not those awarded to The White Reindeer although we are briefly shown Blomberg and Kuosmanen in attendance. Although well-received by Western audiences, The White Reindeer fell into obscurity, but the resurgence of interest in folk horror has brought one of the genre's truest examples back to light.